San Diego, CA, December 5, 2017 --Enrich Financial Wellness celebrates being chosen as the singular financial wellness platform on the list of the “10 Most Valuable HR Technology Solution Providers of 2017” published by Insights Success Magazine. Today’s evolving workplace can create distracted, stressed, unhealthy and confused employees. Gallup reports that over 50% of the workforce is distracted at work. Responding to the needs of these workers creates opportunities for new and innovative technologies. 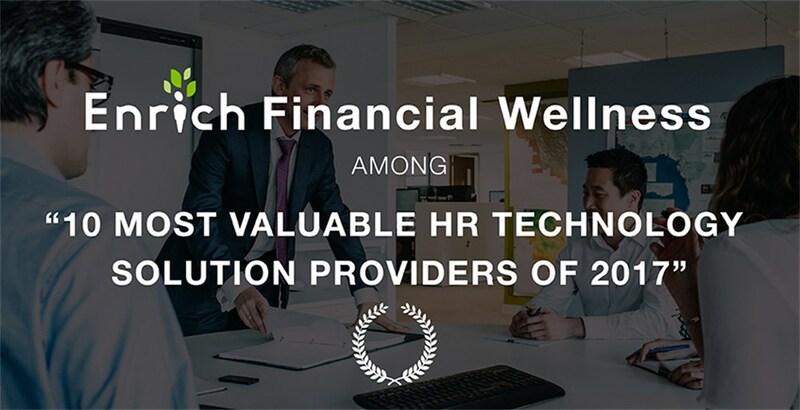 Thus, in October, Insights Success Magazine, focusing on emerging and fast growing companies, culled and published a list of the “10 Most Valuable HR Technology Solution Providers of 2017” including Enrich Financial Wellness.